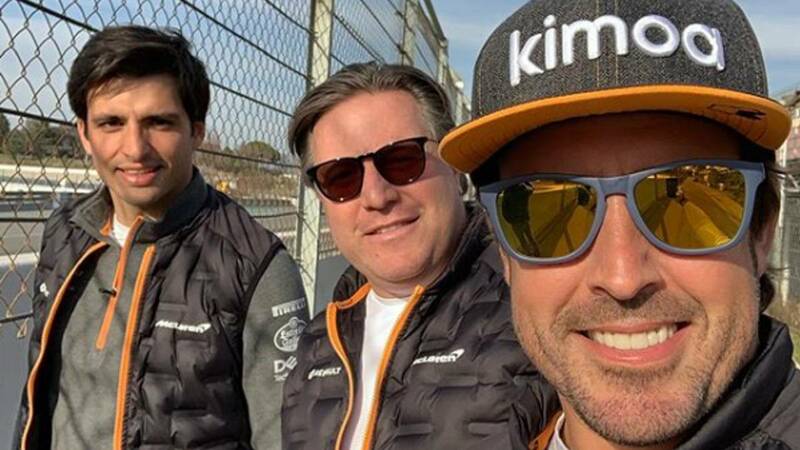 Home F1 Alonso analyzes the McLaren: "The MCL34 is at a good level"
Zak Brown shares the assessment made by the Asturian: "The sensations are better than last year." cautious optimism. This concept, coined by Zak Brown at the end of December to describe the mood of the Woking engineers about the performance of the MCL34, is still very present in the southeast of Great Britain after completing the preseason of the Formula 1 World Championship. 2019. Carlos Sainz and Lando Norris have completed a total of 4,059 kilometers to the Circuit Barcelona Catalunya where it has been able to verify a monoplaza with good top speed, but also with some weak points to improve as a strong understeer that can take you away from your big goal for this season: lead the middle of the grid. Asked about the revenue of the new Woking car, Fernando Alonso says that some things that have been changed for this year's car are working even better than expected: "I believe that the car is at a good level, we've seen it these weeks, All in reliability the first week, and also benefits in this second. Some of the philosophies or things that have been changed in this car are working as expected, others better than expected because we have had a positive response. " An assessment that also shares Brown, who says in 'Movistar F1' that the new British machine responds to the demands of the pilots: "We have taken many turns and it seems that the car responds to what the riders want. It is still too early to make predictions, but certainly the sensations are better than last year. I think aerodynamics was our weakest point last year, but the goal is not to focus on just one area. The car responds well to the development that we planned last year when we checked the elements that failed. What we can say is that the car is significantly different from last year in many areas ".